Gaddafi and Martin: best buddies? 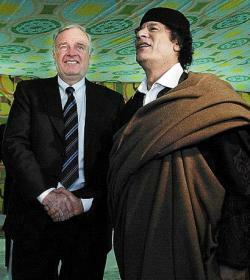 Prime Minister Paul Martin was in Libya yesterday and met with its dictator, Muammar Gaddafi. Martin apparently hit it off with the man known for his role in the bombing of Pan Am Flight 103 over Lockerbie Scotland as the dictator remarked, “On a personal level, we have gained a quite personal friendship. We are friends not just because he is the Prime Minister of Canada but we shall always be friends, even if he is not the Prime Minister”. Martin was in the Libyan desert for the tent summit to mark the one year anniversary of Libya’s renunciation of its weapons of mass destruction program. While this marks a good first step for the north African nation, Gaddafi still reigns over countless human rights abuses. While Canada may have economic interests in the area, it is unfortunate that our Prime Minister is visiting with Gaddafi (given the human rights abuses and criminal past) rather than focusing his efforts elsewhere. A particularly good question considering that I don’t remember the last time a Canadian Prime Minister has even gone on a ‘trade mission’ to our most significant trading partner, the United States. The National Post has more details on the visit. Also, check out the Lybian news service’s account of the tent summit, it’s amusing. Quotes like “Paul Martin expressed during the meeting his country’s appreciation of the wisdom, vision and strategic analysis of the Leader and his initiatives and efforts in securing peace and stability in the world. He underlined that all of the Canadian political figures appreciate and respect the Leader’s vision, initiative and efforts at all levels.” (Sarcastic emphasis added by me) show the hallmarks of a military dictator’s grip on the media: narcissistic and editorialized news. Posted on December 20, 2004 Author Stephen TaylorCategories OtherLeave a comment on Gaddafi and Martin: best buddies?